A liger, a hybrid between a male lion and female tiger. In biology, a hybrid is the offspring of individuals of different taxonomic groups or, in another sense, an offspring of crosses between populations, breeds, or cultivars within a single species. In the first sense of the term, a hybrid is the result of interbreeding between two animals or plants of different taxa, whether between individuals belonging to different species within the same genus (interspecific hybrids or crosses), different subspecies within the same species (intraspecific hybrids), or different genera (intergeneric hybrids). Extremely rare hybrids between individuals of different families (interfamilial hybrids) are known, such as the guineafowl hybrids. Examples of such hybrids are a mule, a cross between a male donkey (Equus asinus) and a female horse (Equus caballus), and a hinny, a cross between a male horse and a female donkey. A liger is the offspring of a male lion (Panthera leo) and a female tiger (Panthera tigris), while a tigon is the offspring of a male tiger and a female lion. In the second sense of the term, often used in plant and animal breeding, a hybrid results from crosses between populations, breeds, or cultivars within a single species or subspecies. In plant and animal breeding, hybrids commonly are produced and selected because they have desirable characteristics not found or inconsistently present in the parent individuals or populations. Such hybridizations are fertile and allow the development of particular plants and animals of great value for people, such as a more disease resistant crop or flowers with rare beauty. As a general rule, animals and plants belonging to distinct species do not produce offspring when crossed with each other, and if viable offspring are produced, they generally are infertile (although not always). For example, while different species of the horse family can interbreed, offspring such as the mule are almost invariably sterile. Przewalski's horse and the domestic horse are the only equids that can crossbreed and produce fertile offspring. (Several female mules have produced offspring when mated with a purebred horse or donkey.) 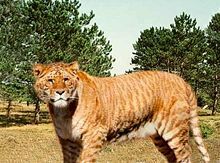 Because male ligers and male tigons are sterile, the hybrid line cannot be continued even though female ligers and female tigons often are fertile. Interspecific plant hybrids sometimes can reproduce as a result of polyploidy, such as triticale, a polyploid hybrid of wheat and rye. Single cross hybrids. Single cross hybrids result from the cross between two pure bred lines and produces an F1 generation called an F1 hybrid (F1 is short for Filial 1, meaning "first offspring"). The cross between two different homozygous lines produces an F1 hybrid that is heterozygous—that is, having two alleles, one contributed by each parent. Double cross hybrids. Double cross hybrids result from the cross between two different F1 hybrids (Rawlings and Cockerham 1962). Three-way cross hybrids. Three-way cross hybrids result from the cross between one parent that is an F1 hybrid and the other is from an inbred line (Darbeshwar 2000). Triple cross hybrids. Triple cross hybrids result from the crossing of two different three-way cross hybrids. Population hybrids. Population hybrids result from the crossing of plants or animals in a population with another population. These include crosses between organisms such as interspecific hybrids or crosses between difference races. Interspecific hybrids result from a cross between two species, normally from within the same genus. The offspring display traits and characteristics of both parents. The offspring of an interspecific cross very often are sterile; thus, hybrid sterility prevents the movement of genes from one species to the other, keeping both species distinct (Keeton 1980). Sterility is often attributed to the different number of chromosomes the two species have, for example donkeys have 62 chromosomes, while horses have 64 chromosomes, and mules and hinnies have 63 chromosomes. Mules, hinnies, and other normally sterile interspecific hybrids cannot produce viable gametes because the extra chromosome cannot make a homologous pair at meiosis, meiosis is disrupted, and viable sperm and eggs are not formed. However, fertility in female mules has been reported with a donkey as the father (McBeath 1988). Most often other mechanisms are used by plants and animals to keep gametic isolation and species distinction. Species often have different mating or courtship patterns or behaviors, the breeding seasons may be distinct, and even if mating does occur, antigenic reactions to the sperm of other species prevent fertilization or embryo development. The development of new species from hybridization is known from plants, through the development of polyploidy. The induction of polyploids is a common technique to overcome the sterility of a hybrid species. Triticale is the hybrid of wheat (Triticum turgidum) and rye (Secale cereale). It combines sought-after characteristics of the parents, but the initial hybrids are sterile. After polyploidization, the hybrid becomes fertile and can thus be further propagated to become triticale. The Lonicera fly is the first known animal species that resulted from natural hybridization. Until the discovery of the Lonicera fly, this process was known to occur in nature only among plants. While it is possible to predict the genetic composition of a backcross on average, it is not possible to accurately predict the composition of a particular backcrossed individual, due to random segregation of chromosomes. In a species with two pairs of chromosomes, a twice backcrossed individual would be predicted to contain 12.5 percent of one species' genome (say, species A). However, it may, in fact, still be a 50 percent hybrid if the chromosomes from species A were lucky in two successive segregations, and meiotic crossovers happened near the telomeres. The chance of this is fairly high, 1/2^(2×2)=1/16 (where the "two times two" comes about from two rounds of meiosis with two chromosomes); however, this probability declines markedly with chromosome number and so the actual composition of a hybrid will be increasingly closer to the predicted composition. Hybrids are often named by the portmanteau method, combining the names of the two parent species. For example, a zeedonk is a cross between a zebra and a donkey. Since the traits of hybrid offspring often vary depending on which species was mother and which was father, it is traditional to use the father's species as the first half of the portmanteau. For example, a liger is a cross between a male lion (Panthera leo) and a female tiger (Panthera tigris), while a tigon is a cross between a male tiger and a female lion. A liger is denoted scientifically as Panthera tigris × Panthera leo. Dog hybrids are crosses between different breeds and are often bred selectively. Dzo, zo, or yakow; a cross between a domestic cow/bull and a yak. Ursid hybrids, such as the grizzly-polar bear hybrid, occur between black bears, brown bears, Kodiak, and polar bears. Ligers and tigons (crosses between a lion and a tiger) and other ''Panthera'' hybrids such as the Lijagulep. Various other wild cat crosses are known involving the lynx, bobcat, leopard, serval, and so forth. Bengal cat, a cross between the Asian leopard cat and the domestic cat, one of many hybrids between the domestic cat and wild cat species. The domestic cat, African wild cat, and European wildcat may be considered variant populations of the same species (Felis silvestris), making such crosses non-hybrids. Fertile Canid hybrids occur between coyotes, wolves, dingoes, jackals, and domestic dogs. Hybrids between black rhinos and white rhinos have been recognized. Wolphin, a fertile but very rare cross between a false killer whale and a bottlenose dolphin. 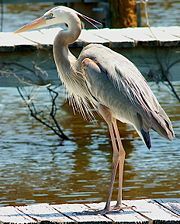 The Wurdmann's heron, a cross of the white heron and the great blue heron. Gamebird hybrids, hybrids between gamebirds and domestic fowl, including chickens, guineafowl, and peafowl, interfamilial hybrids. Hybridization between the endemic Cuban crocodile (Crocodilus rhombifer) and the widely distributed American crocodile (Crocodilus acutus) is causing conservation problems for the former species as a threat to is genetic integrity. Hybrids should not be confused with chimaeras, such as the chimera between sheep and goat known as the geep. Wider interspecific hybrids can be made via in vitro fertilization or somatic hybridization; however the resulting cells are not able to develop into a full organism. An example of interspecific hybrid cell lines is the humster (hamster x human) cells. Plant species hybridize more readily than animal species, and the resulting hybrids are more often fertile hybrids and may reproduce. There still exist sterile hybrids and selective hybrid elimination where the offspring are less able to survive and are thus eliminated before they can reproduce. Sterility in a hybrid is often a result of chromosome number; if parents are of differing chromosome pair number, the offspring will have an odd number of chromosomes, leaving them unable to produce chromosomally balanced gametes. For example, if a hybrid received 10 chromosomes from one parent and 12 from another parent, the chromosomes would not be balanced for meiosis. A number of plant species, however, are the result of hybridization and polyploidy, where an organism has more than two homologous sets of chromosomes. For example, if the plant had two sets of chromosomes from both parents, giving it four sets of chromosome, it would be balanced for meiosis. Many plant species easily cross pollinate and producing viable seeds, with the distinction between each species often maintained by geographical isolation or differences in the flowering period. Animals, being more mobile, have developed complex mating behaviors that maintain the species boundary and when hybrids do occur, natural selection tends to weed them out of the population since these hybrids generally can not find mates that will accept them or they are less adapted and fit for survival in their habitats. Since plants hybridize frequently without much work, they are often created by humans in order to produce improved plants. These improvements can include the production of more or improved seeds, fruits, or other plant parts for consumption, or to make a plant more winter or heat hardy, or to improve its growth and/or appearance for use in horticulture. Much work is now being done with hybrids to produce more disease resistant plants for both agricultural and horticultural crops. In many groups of plants, hybridization has been used to produce larger and more showy flowers and new flower colors. Another form of polyploidy, called allopolyploidy, occurs when two different species mate and produce hybrids. Allopolyploids are polyploids with chromosomes derived from different species. Usually the typical chromosome number is doubled in successful allopolyploid species. With four sets of chromosomes, the genotypes can sort out to form a complete diploid set from the parent species; thus, they can produce fertile offspring that can mate and reproduce with each other but can not back-cross with the parent species. Triticale is an example of an allopolyploid, having six chromosome sets, four from wheat (Triticum turgidum) and two from rye (Secale cereale). Allopolyploidy in plants often gives them a condition called hybrid vigor or heterozygote advantage, resulting in plants that are larger and stronger growing than either of the two parent species. Allopolyploids are often more aggressive growing and can be invaders of new habitats. Polyploidy can an attractive attribute in some fruits. Bananas and seedless watermelon, for instance, are intentionally bred to be triploid, so that they will produce no seeds. Many hybrids are created by humans, but natural hybrids occur as well. Plant breeders make use of a number of techniques to produce hybrids, including line breeding and the formation of complex hybrids. Tangelo, a hybrid of a Mandarin orange and a pomelo or a grapefruit, which may have been developed in Asia about 3,500 years ago. Wheat; most modern and ancient wheat breeds are themselves hybrids. ×Heucherella tiarelloides, or Heuchera sanguinea × Tiarella cordifolia is an "intergeneric hybrid" a hybrid between individuals in two different genera. Hybridization between two closely related species is well known in nature. Many hybrid zones have been identified where the ranges of two species meet, and where hybrids are continually produced in great numbers. For example, the shifting of the hybrid zone between black-capped chickadees and Carolina chickadees in southeastern Pennsylvania, as measured by DNA markers, has been studied and related to possible environmental factors, such as global warming (Curry 2005). In some species, hybridization plays an important role in evolutionary biology. While most hybrids are disadvantaged as a result of genetic incompatibility, the fittest survive, regardless of species boundaries. They may have a beneficial combination of traits allowing them to exploit new habitats or to succeed in a marginal habitat where the two parent species are disadvantaged. This has been seen in experiments on sunflower species. Unlike mutation, which affects only one gene, hybridization creates multiple variations across genes or gene combinations simultaneously. Successful hybrids could evolve into new species within 50 to 60 generations. This leads some scientists to speculate that life is a genetic continuum rather than a series of self-contained species. Where there are two closely related species living in the same area, less than 1 in 1000 individuals are likely to be hybrids because animals rarely choose a mate from a different species (otherwise species boundaries would completely break down). Some species of Heliconius butterflies exhibit dramatic geographical polymorphism of their wing patterns, which act as aposematic signals advertising their unpalatability to potential predators. Where different-looking geographical races abut, inter-racial hybrids are common, healthy, and fertile. Heliconius hybrids can breed with other hybrid individuals and with individuals of either parental race. These hybrid backcrosses are disadvantaged by natural selection because they lack the parental form's warning coloration, and are therefore not avoided by predators. A similar case in mammals is hybrid white-tail/mule deer. The hybrids do not inherit either parent's escape strategy. White-tail deer dash, while mule deer bound. The hybrids are easier prey than the parent species. In birds, healthy Galapagos finch hybrids are relatively common, but their beaks are intermediate in shape and less efficient feeding tools than the specialized beaks of the parental species, so they lose out in the competition for food. Following a major storm in 1983, the local habitat changed so that new types of plants began to flourish, and in this changed habitat, the hybrids had an advantage over the birds with specialized beaks—demonstrating the role of hybridization in exploiting new ecological niches. If the change in environmental conditions is permanent, or is radical enough that the parental species cannot survive, the hybrids become the dominant form. Otherwise, the parental species will re-establish themselves when the environmental change is reversed, and hybrids will remain in the minority. Natural hybrids may occur when a species is introduced into a new habitat. In Britain, there is hybridization of native European red deer and introduced Chinese sika deer. Conservationists want to protect the red deer, but evolution favors the Sika deer genes. There is a similar situation with white-headed ducks and ruddy ducks. When two distinct types of organisms breed with each other, the resulting hybrids typically have intermediate traits (for example, one parent has red flowers, the other has white, and the hybrid, pink flowers) (McCarthy 2006). Commonly, hybrids also combine traits seen only separately in one parent or the other (for example, a bird hybrid might combine the yellow head of one parent with the orange belly of the other) (McCarthy 2006). Most characteristics of the typical hybrid are of one of these two types, and so, in a strict sense, are not really new. However, an intermediate trait does differ from those seen in the parents (for example, the pink flowers of the intermediate hybrid just mentioned are not seen in either of its parents). Likewise, combined traits are new when viewed as a combination. In a hybrid, any trait that does fall outside the range of parental variation is termed heterotic. Heterotic hybrids do have new traits; that is, they are not intermediate. Positive heterosis produces more robust hybrids—they might be stronger or bigger—while the term negative heterosis refers to weaker or smaller hybrids (McCarthy 2006). Heterosis is common in both animal and plant hybrids. For example, hybrids between a male lion and a tigress (female tiger), that is, ligers, are much larger than either of the two progenitors, while a tigon (lioness × male tiger) is smaller. Also the hybrids between the common pheasant (Phasianus colchicus) and domestic fowl (Gallus gallus) are larger than either of their parents, as are those produced between the common pheasant and hen golden pheasant (Chrysolophus pictus) (Darwin 1868). Spurs are absent in hybrids of the former type, although present in both parents (Spicer 1854). Regionally developed ecotypes can be threatened with extinction when new alleles or genes are introduced that alter that ecotype. This is sometimes called genetic mixing (Mooney and Cleland 2001). Hybridization and introgression of new genetic material can lead to the replacement of local genotypes if the hybrids are more fit and have breeding advantages over the indigenous ecotype or species. These hybridization events can result from the introduction of non native genotypes by humans or through habitat modification, bringing previously isolated species into contact. Genetic mixing can be especially detrimental for rare species in isolated habitats, ultimately effecting the population to such a degree than none of the originally genetically distinct population remains (Rhymer and Simberloff 1996; Potts et al. 2001). In agriculture and animal husbandry, the green revolution's use of conventional hybridization increased yields by breeding "high-yielding varieties." The replacement of locally indigenous breeds, compounded with unintentional cross-pollination and crossbreeding (genetic mixing), has reduced the gene pools of various wild and indigenous breeds resulting in the loss of genetic diversity (Sharma). Since the indigenous breeds are often better adapted to local extremes in climate and have immunity to local pathogens, this represents a significant genetic erosion of the gene pool for future breeding. Newer, genetically engineered (GE) varieties are a problem for local biodiversity. Some of these plants contain designer genes that would be unlikely to evolve in nature, even with conventional hybridization (Pollan 2001; Ellstrand 2003). These may pass into the wild population with unpredictable consequences and may be detrimental for the success of future breeding programs. A number of conditions exist that limit the success of hybridization. The most obvious is great genetic diversity between most species. But in animals and plants that are more closely related, hybridization barriers include morphological differences, differing times of fertility, mating behaviors and cues, physiological rejection of sperm cells, or the developing embryo. In plants, barriers to hybridization include blooming period differences, different pollinator vectors, inhibition of pollen tube growth, somatoplastic sterility, cytoplasmic-genic male sterility and structural differences of the chromosomes (Hermsen and Ramanna 1976). Curry, R. L. 2005. Hybridization in chickadees: Much to learn from familiar birds. The Auk 122(3): 747-758. Darbeshwar, R. 2000. Plant Breeding: Analysis and Exploitation of Variation. Pangbourne, UK: Alpha Science International. ISBN 1842650068. Darwin, C. 1868. Variation of Animals and Plants under Domestication, New York, D. Appleton and Co.
Ellstrand, N. C. 2003. Dangerous Liaisons? When Cultivated Plants Mate with Their Wild Relatives. Johns Hopkins University Press. ISBN 080187405X. Hermsen, J. G. T., and M. S. Ramanna. 1976. Barriers to hybridization of Solanum bulbocastanumDun. and S. VerrucosumSchlechtd. and structural hybridity in their F1 plants. Euphytica 25(1): 1-10. Retrieved October 10, 2008. Keeton, W. T. 1980. Biological Science. New York: Norton. ISBN 0393950212. McCarthy, E. M. 2006. Handbook of Avian Hybrids of the World. Oxford: Oxford University Press. ISBN 0195183231. Mooney, H. A., and E. E. Cleland. 2001. The evolutionary impact of invasive species. Proc Natl Acad Sci U S A. 98(10): 5446–5451. Retrieved October 10, 2008. Pollan, M. 2001. The Year in Ideas, A-Z. Genetic pollution. New York Times December 9, 2001. Retrieved October 10, 2008. Potts, B. M., R. C. Barbour, and A. B. Hingston. 2001. Genetic pollution from farm forestry using eucalypt species and hybrids. A report for the RIRDC/L&WA/FWPRDC; Joint Venture Agroforestry Program; RIRDC Publication No 01/114; RIRDC Project No CPF - 3A; ISBN 0642583366; Australian Government, Rural Industrial Research and Development Corporation. Retrieved October 10, 2008. Rawlings, J. O., and C. C. Cockerham. 1962. Analysis of double cross hybrid populations. Biometrics 18(2): 229-244. Rhymer, J. M., and D. Simberloff. 1996. Extinction by hybridization and introgression. Annual Review of Ecology and Systematics 27: 83-109. Retrieved October 10, 2008. Rong, R., A. C. Chandley, J. Song, S. McBeath, P. P. Tan, Q. Bai, and R. M. Speed. 1988. A fertile mule and hinny in China. Cytogenet Cell Genet. 47(3):134-9. Retrieved October 10, 2008. Stokes, D., C. Morgan, C. O'Neill, and I. Bancroft. 2007. Evaluating the utility of Arabidopsis thaliana as a model for understanding heterosis in hybrid crops. Euphytica 156(1-2): 157-171. Sharma, D. n.d. Genetic pollution: The great genetic scandal. Bulletin 28. Retrieved October 10, 2008. Spicer, J. W. G. 1854. Note on hybrid gallinaceous birds. Zoologist 12: 4294-4296. Wricke, G., and E. Weber. 1986. Quantitative Genetics and Selection in Plant Breeding. Berlin: W. de Gruyter. ISBN 0899251439.